I returned to my office to find a message from DIY Themes that the final release of Thesis 1.7 is now available for download. I now faced a moral dilema. Do I test Thesis (as I promised several clients) or install the new Droid 2.1 OS. A promise is a promise, and after all you guys pay the bills. The expensive toy Dorid will have to wait. So I installed it and it’s now live on this site. Writing this post took much longer. I know it doesn’t look any different but give me a few days. 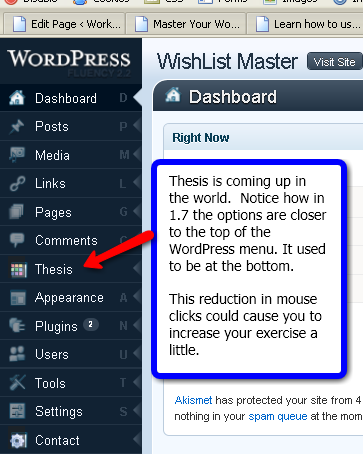 I haven’t had an opportunity to try out the new features yet, but one change I noticed right away and that’s the fact that the Thesis options are now just below the Comments on the WordPress menu. Before they were all the way at the bottom. Not a big deal, but it helps. I’ll start playing with the options and seeing how it behaves with WishList Member and report back.